With our Mediterranean style design and Olympic size pool, the Red Lion Hotel Bakersfield translates into the highest standards for guest comfort and service combined with the best in modern amenities. 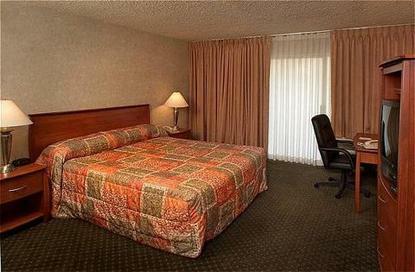 Our prime location is at the junction of Freeway 99 and Hwy 58 in the heart of Bakersfield. Our facilities are just 2 miles west of downtown and 5 miles from Meadows Field airport. A beautiful courtyard, contemporary oversize deluxe rooms, data connections and cardio fitness center combines modern technology and old world service in one centrally located hotel. We have 165 brand new contemporary rooms that include luxurious poolside Executive Suites, poolside Jacuzzi Suites, Jr. Executive Suites and deluxe oversized rooms. All our rooms feature high speed wireless internet access, an armoire with a 27 inch color cable TV, room service, coffee makers, iron with board and hairdryers. Fax and copy services are also available. Our poolside Executive and Jacuzzi Suites include a business size desk and leather chair, coffee table, seating area, microwave, refrigerator, 2 bathrooms and large patios or balconies overlooking the pool and courtyard. Every room is a business center with data connections in all 165 rooms. Just plug in and you are in business. The heated Jacuzzi, pool and Cardio Fitness Center are available to help you to stay in shape or just relax. Complete meeting and banquet facilities include over 4,000 square feet of space with room capacity for 300 people. Our conference Specialists will take care of every detail. We are proud to host Finish Line Bar & Grill. Our Executive Chef has created a menu that sets a new standard in the culinary arena. In the bar you can enjoy pool tables, the latest game on one of many TVs or a live DJ with dancing after the sun goes down.